Free Wi-Fi flat-panel TVs and fully equipped kitchens help guests feel at home at the non-smoking TownePlace Suites Vernal. All 85 rooms at the non-smoking TownePlace Suites are set on four floors and come with fully equipped kitchens and separate seating areas. In-room amenities include free Wi-Fi and flat-panel TVs. The hotel offers breakfast each morning. You'll also find business services a workout room outdoor barbeque area and indoor pool and hot tub on the premises. The laundry facilities are a boon for guests on extended travels. Parking is free. Pets are allowed for a fee. 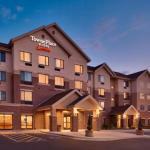 TownePlace Suites sits in the northeast corner of Utah about 35 minutes from the Colorado State Line. Plan an adventure at Dinosaur National Monument 40 minutes away or take a hike at Red Fleet State Park 30 minutes away. Utah Field House of Natural History State Park Museum and the Western Heritage Museum are both two miles from the hotel. The closest major airport is Salt Lake City International Airport 176 miles away.